rec. no information supplied, mid-1980s? Richard Harvey, who started his career as a recorder player and recorded several albums in the 1980s, has of late been working predominantly as a conductor and a composer. This release is a reissue of the 1987 album on ASV of the same title (The Genteel Companion CD GAU 117), augmented with two items from another ASV release, “Four concertos for violins and recorder”, from 1986 (ASV CD DCA 523). The recorder was a popular instrument among professionals and amateurs in England during the early 18th century. A number of English composers, including John Baston, William Babell and Robert Woodcock, wrote concertos for the “sixth flute”. The sixth flute is a recorder in D, a sixth higher than the treble (alto) recorder, hence the name “sixth flute”. This album opens with John Baston’s Concerto No.2, originally in D major for sixth flute, here played by Richard Harvey in C major, almost certainly on a descant (soprano) recorder in C. I wonder if Harvey didn’t have a sixth flute at his disposal at the time. Handel’s Trio Sonata Op.2 No.4 in F was originally written with the upper parts assigned to two violins, with an alternative version for flute and violin. Here it is played in a version for recorder, violin and continuo. The Sonata in G is one of the set of six sonatas “composed by Mr. W. Crofts & an Italian Mr.” It is generally attributed to the Englishman William Croft, but in the booklet Edgar Hunt and Richard Wood argue that it is likely to have been composed by the Moravian composer Gottfried Finger. It is a single-movement piece in variation form. Jacob van Eyck was a blind player of carillon and recorder. His two volumes of "Der Fluyten Lust-hof" (1649 and 1654) contain nearly 150 pieces in variation form for “hand-fluyt”, a kind of soprano recorder. "Der Fluyten Lust-hof" has remained the largest collection of music for a single wind instrument ever composed. The variations are based on popular tunes of the day. Van Eyck treated the Dutch tune Wat zlmen op den Avond doen? (What shall we do in the evening?) with his customary chain variation form. Each successive variation is based on the preceding variation and consists of notes of shorter time value, which leads to increasing virtuosity. Two selections from "The Division Flute" (1706) are included in this album – Green Sleeves to a Ground, an anonymous setting of the famous Elizabethan folk-tune Greensleeves, and A Division on a Ground by Mr. Finger, by the above-mentioned Gottfried Finger. Music publishers in the 18th century were often unscrupulous. Il pastor fido was published in Paris in 1737 as Vivaldi’s Op.13. Musical detective work in the 20th century revealed that it was actually a fake written by French composer Nicolas Chédeville. The most well-known sonata from the set is Sonata No.6 in G minor. Chédeville plundered thematic materials from Vivaldi, and resorted to copying almost note-by-note the opening movement of Vivaldi’s Op.4 No.6, a violin concerto in G minor, to form the last movement of his G minor sonata. Girolamo Dalla Casa wrote two books of "Il vero modo di diminuir" (1584), which was a manual on ornamentation, with model ornaments for each interval and practical application to popular Italian madrigals and French chansons. The manual was written for every kind of instrument (“con tutte le sorti di stromenti”). Many selections from it have been performed and recorded by recorder players. The division on the French tune "Petit Jacquet" is included here. Recorder was one of the instruments Telemann played, which explains why his writing for the instrument was always idiomatic. The Concerto di Camera in G minor is not as well-known as his recorder sonatas or the Suite in A minor for Recorder and Strings, but is nevertheless very attractive. Jean-Marie Leclair, one of the very few composers who died of murder, was a violin virtuoso. The vast majority of his compositions were for his own instrument. To conclude this album, one of his violin sonatas is transposed from D to F and played on a soprano recorder. I have many reservations about Richard Harvey’s recorder playing on this album. The biggest problem is Mr. Harvey’s habit of frequently putting a swell on individual notes, particularly for short notes. On the recorder, an increase in breath pressure results in louder dynamics as well as slightly higher pitch, so any swell on a note will result in a small pitch glide as well. Frans Brüggen famously played with quite a bit of swells, but his swells were part of his very expressive and musically convincing playing, and I don’t recall him using it with such abundance or on short notes as Richard Harvey does here. Mr. Harvey’s swells are unmusical to my ears. Richard Harvey also does not always release his notes properly. Some of the note endings have a slight drop in pitch. Another aspect of Mr. Harvey’s playing is that he plays all upbeats and last beat of each bar long, while they should be short and light. Besides, for pieces in variation form, Richard Harvey speeds up in variations with shorter note values. This has no musical justification, that I can see. He simply appears not to be able to stay in the same tempo when the note values get shorter. A more uniform tempo would give the variations a unity that is sorely missing in Mr. Harvey’s playing here. His changes in speed make the variations sound disjointed. The two selections from "The Division Flute" suffer a great deal from stylistic idiosyncrasies. The triple-meter ground by Gottfried Finger, which should be played long-short-shorter, is played long-short-long instead, which is not in good taste. "Greensleeves" also suffers from long upbeats, sudden quickening of tempo in the variations with shorter note values and persistently delayed entries of phrases. The sonata from Il Pastor fido also suffers from long upbeats throughout. In the second movement, each of repeated crotchets in the fugal counter-subject receives a heavy dose of swell, which makes a most unwelcome listening experience. The opening descending motif of the first movement of Telemann’s Concerto di Camera, played stylishly short by the violins, is played long by Richard Harvey. The long version sounds incongruous and out-of-keeping with what his colleagues do just a moment earlier. The stylistic disparity prompted me to check Telemann’s manuscript, and I found that the staccato markings were given by Telemann. Regarding the recorders used on this album: a few of the recorders are identified in the booklet as instruments made by the renowned maker Friedrich von Huene. I wonder if the other recorders that are not identified are also von Huene instruments. There is a two-page tribute to Friedrich von Huene at the end of the booklet, which is quite unusual. Perhaps Friedrich von Huene’s advanced years and rapidly declining health prompted this special tribute. Edgar Hunt and Richard Wood are identified as the authors for the major part of the booklet. Both were/are well-known in recorder circles (Hunt passed away in 2006), and were close personal friends for decades with Friedrich von Huene. I was surprised to read from the tribute to von Huene that “In 1969 he started his own workshop, making only recorders.” In fact, Friedrich von Huene started his workshop in 1960, and made recorders and flutes; at one point also baroque oboes. Apart from this, the booklet, in English only, provides very good background information on the composers and pieces featured on this album. 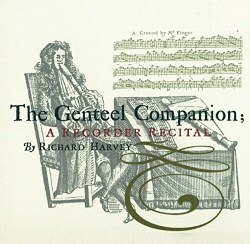 For the past thirty years, since The Genteel Companion was originally released, many more recordings featuring the recorder have become available. The majority of the recorder players featured are blessed with virtuosic technique, excellent intonation and mostly importantly, good awareness of performing style. All of the pieces on "The Genteel Companion" have been given superior performances. Do seek out those other albums if you are interested in this repertoire.